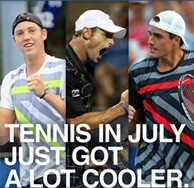 The Atlanta Tennis Championships announced today 2003 US Open champion Andy Roddick, 2010-11 ATC finalist John Isner and US Open mixed doubles champion Jack Sock have committed to play in the tournament, which is the first ATP World Tour event of the 2012 US Open Series. In related news, the ATC and Atlantic Station have signed a multi-year deal that will bring tennis into the central area of the city July 14-22. Roddick, who played in the inaugural ATC in 2010, has won 30 ATP World Tour titles and was the dominant American player of the last decade. He also reached three Wimbledon and one US Open finals between 2004 and 2009. In 2001 he won his first ATP World Tour title in Atlanta. He is currently ranked No. 14 in the world. "I have some great memories of playing in Atlanta where I won my very first ATP World Tour event," Roddick said. "To return and have an opportunity to play in this remarkable new venue will be very exciting. July summer nights in the middle of Atlanta with the skyline lights towering above, along with the supportive tennis fans that always turn out here will make for one of the best stops on tour. I’m looking forward to playing in the Atlanta Tennis Championships." Isner, who has signed a multi-year deal, is currently ranked No. 18 in the world, a tie for his career-high ranking. The towering 6’9" player is a former All-American at the University of Georgia and NCAA Division I champion. With a dominating first serve, he captured tournament wins in 2011 Winston-Salem Open, 2011 Newport and 2010 Auckland. He was second in the ATP this year with 811 aces. Isner was also named to the U.S. Davis Cup team for the first time in 2010. Isner is best known for winning the longest tennis match ever at 2010 Wimbledon. He played Nicholas Mahut in a match that lasted 11 hours and 5 minutes, for a total of 163 games, over the course of three days. "I’m excited about returning to the Atlanta Tennis Championships and playing in front of the enthusiastic tennis fans in Georgia," Isner said. "I’m also looking forward to playing at Atlantic Station, in the heart of the city, this year and the next several years. The energy and excitement of this unique setting will be fun for all the players." Sock scored his biggest achievement when he and Marietta, Ga.’s Melanie Oudin won the US Open mixed doubles crown last September which included a victory over the top-ranked team. Sock also won consecutive titles at the USTA Boys’ 18s National Championships in 2010-11. Sock said, "It’s a real pleasure to attend the site announcement of Atlantic Station as the new home of the Atlanta Tennis Championships. This is a spectacular venue with a great ambiance and I can’t wait to compete here in July. I am truly honored for the tournament to include me in their plans and look forward to putting out the best performance I can." Tournament Director Bob Bryant said, "With the addition of Andy, John and Jack, we are far ahead of past years in bringing in top talent at such an early date. Atlanta tennis fans watched Andy win his first title here in 2001 and he’s been a crowd favorite ever since. Georgia Bulldog fans are familiar with Isner’s 140-mph-plus serve and powerful forehand and we expect to see even more impressive and thrilling tennis from him for many years to come. Jack burst on the scene by winning his first Grand Slam title at this year’s US Open, playing mixed doubles with Atlanta’s own Melanie Oudin. We’re excited that these great players will be competing in this year’s tournament."